As a professional businessman it is natural that you place your business interests as one of your top priorities! It may possibly be doing well because of your sweat, blood, money and competent personnel. And, as such you certainly want to offer due reverence to your company’s esteemed logo by etching it on your office floors. For sure the company is one of your dreams that came true and is your bread and butter and source of being or accomplishment so to speak! Now, you want your loyal clients and people in general to see your company logo the very minute they enter your business headquarters. You, like any other successful businessman want that your company make a mark and be recognized everywhere or at least in your business. Remember your company logo is part of your image and brand building tool. Terrazzo toilet partitions are very popular nowadays. A lot of construction projects have applied this material due to its durability, exquisiteness and versatility. In this article, Terrazzo Australia Marble will discuss a special type of terrazzo partition, the San Marco stone. The San Marco stone is considered to be the best in class when it comes to kitchen benchtops and commercial areas. Terrazzo Australian Marble has introduced the San Marco Stone partition range to extend this remarkable product to the partition market. The San Marco Stone is perfect for vanities and urinal screens. Why San Marco Stone stands out from the rest? * Exquisite design– you can have a lot of colors you can choose from. Whether you are planning to create a modern interior or urban interior, there are wide arrays of texture selections you can use for your interior design. * Waterproof – San Marco stones are immune to moisture. Because of this it does not leave grout or stains when water is applied to the partition. This makes the material very easy to clean in the long run. * Hygienic – The material used is completely seamless and smooth. It has almost a glass-like surface making it impossible for mould and bacteria to grow on. 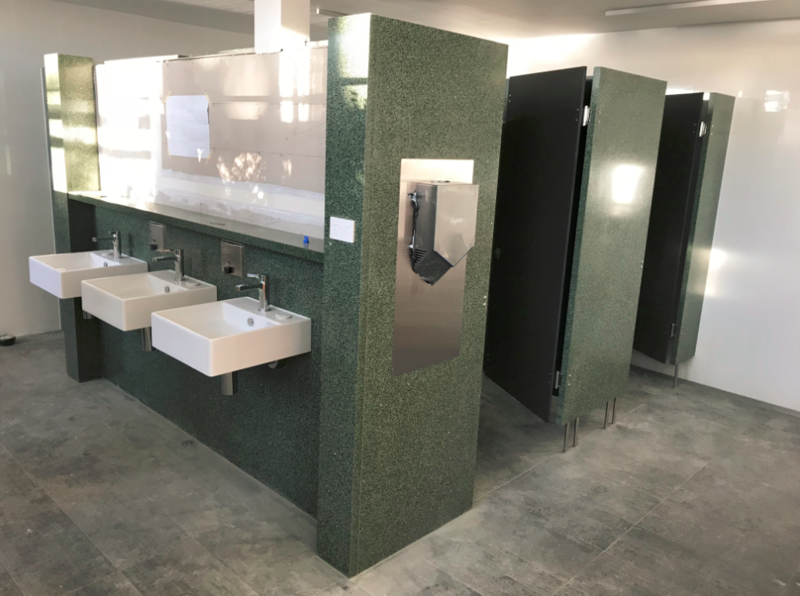 * Vandal proof– if you are operating a public toilet, you will love this particular property of San Marco partition. Stains from pentel pens or paints can be easily removed. Say goodbye to vandalisms, your toilet will forever be clean like the first time it was first installed. * Scratch proof– San Marco Stone is virtually scratch proof. 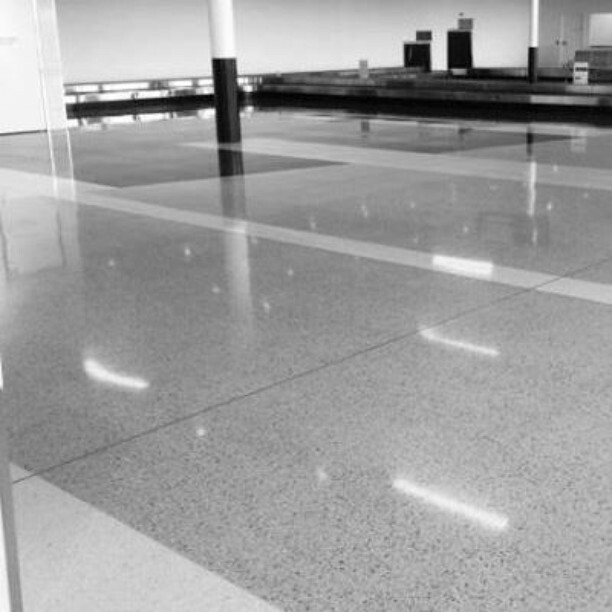 Terrazzo Australian Marble structured this material to resist dings and scratches. This is very beneficial to home owners and business owners who want to maintain a level of perfection to their establishments. * Strength– San Marco Stone is around 30mm thick. This makes it very strong and durable. In the history of Terrazzo Australian Marble, we have not yet replaced a broken panel in over 7 years of installations. This is a testament on highly dependent this material is. * Warranty– Home owners or business owners who avail the San Marco Stone partition will have a 10 year warranty. Terrazzo Australia Marble will furnish a written guarantee against defects due to improper and/or defective materials and/or workmanship. You can be assured of a peace of mind that your partition will last a decade. * Easy to Clean– Simply use any suitable solvent. Terrazzo Australia Marble recommends using solvents that are not acidic and have a PH value of 5. You can simply use a squeegee to remove dirt and gunk. 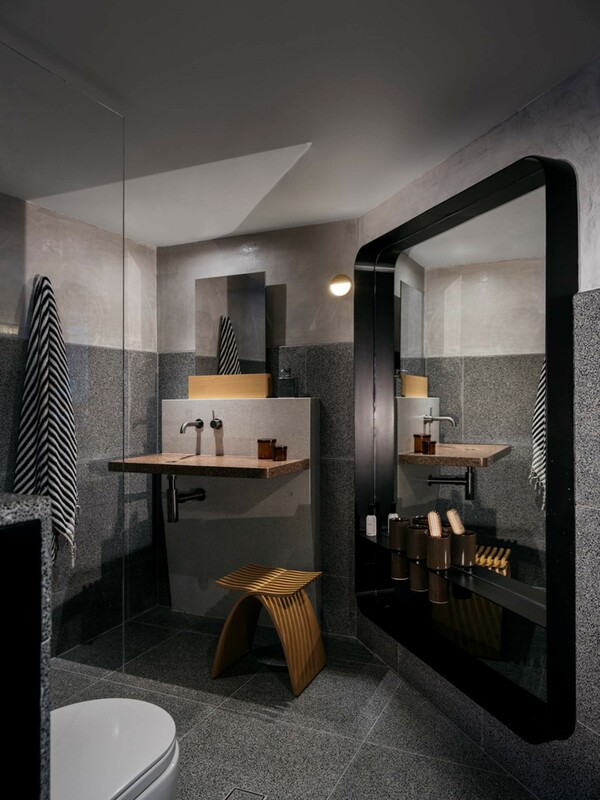 If you are looking for the best material for your toilet partition, Terrazzo Australia Marble recommends the San Marco Stone. This is the best of its class in the industry. We guarantee that your toilet will stand out. Slip, trips and falls are costly public health problems in Australia. The cost due to these is estimated to be a whopping 4 billion USD annually. In this article, we will discuss the importance of having safety flooring solutions for your terrazzo marble stone and how you can implement them. Like mentioned above the costs is 4 billion USD per year. Hospitalization costs around 1.3 billion dollars. The most expensive legal settlements for a slip-related incident is around 2.75 million dollars. The cost of slip incidents is very expensive, especially for owners and builders. There are three laws to consider in implementing slip resistance for your projects. You and your contractor need to be aware of them for future projects. The Building Code of Australia (BCA) includes safety performance requirements for safe design. Most commercial buildings are required to provide slip-resistant surfaces for safe movement, specifically in areas of emergency access and egress. The slip-resistance requirements of Clauses D2.10, D2.13 and D2.14 of the BCA states that non-slip and non-skid surfaces must be installed on pedestrian ramps, stair treads and landings. Furthermore, other parts of buildings may need to comply with disability access requirements. The Disability (Access to Premises-Buildings) Standards 2010 is Commonwealth legislation which tries to improve access and use of facilities so that they are accessible for all. The improvement in the design not only provides a safer environment but help to facilitate community interaction by reducing barriers that may affect the participation of disabled persons. Parts of buildings that are required to be accessible must have accessways to and within certain areas. An accessway is defined as a continuous accessible path of travel as defined in AS 1428.1, which in turn requires an accessway to be slip resistant. Whilst many may argue that slip resistance is not a specific prescriptive requirement, the requirement for slip resistance appears to be an inherent requirement as not to discriminate against those who may have difficulty walking on slippery and/or polished surfaces (for those with difficulty walking on highly reflective surfaces). While Occupational Health and Safety (OHS) or Workplace Health and Safety (WHS) regulations and models are set to be harmonized, this won’t be for a long time yet. However, the general principles essentially require employers and those who have control (or part thereof) to show due diligence in ensuring that the risk of injury due to slips, trips, and falls are reduced to as low as reasonably practicable (ALARP). This essential requires that floors are to be non-slip, non-skid or slip resistant through performance-based criteria rather than prescriptive requirements. There are also usually duties for responsibility for the design of the workplace, which extends to those who design, specify or supply floor surfaces intended for places of work. How can we make Terrazzo align with safety? * Utilize terrazzo pavers for outdoor flooring. These tiles are honed in the factory and shot blast to give the tiles an anti-slip texture. Each tile is individually chamfered for that prestigious look. It is anti-slip, easy to clean and can withstand elements. 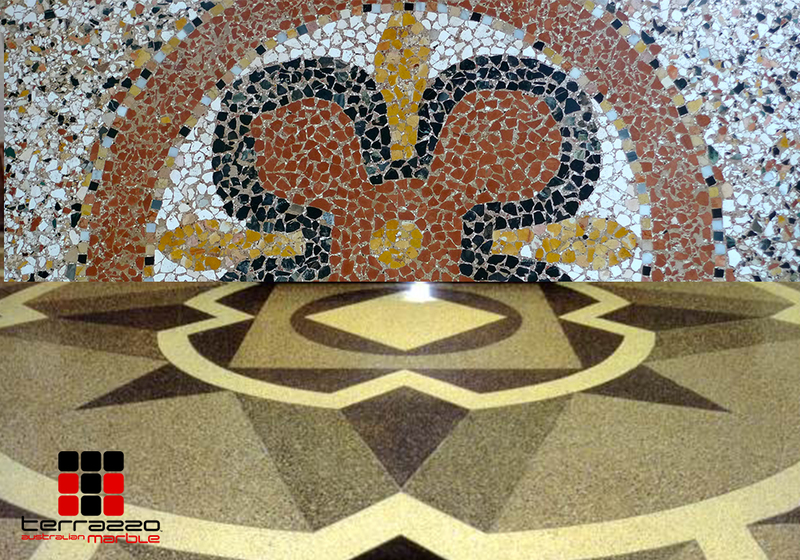 * Utilize terrazzo tiles/terrazzo in-situ with Honed Anti-Slip Finish. The floor is ground on site to a honed finish. If the non-slip finish is required a non-slip additive is added to the manufacturing process that enables the floor to achieve at least an R10 finish that will not wear off. This is very useful for high foot traffic areas. * Observe the construction of your flooring. Make sure it is even. Coordinate with your architect or engineer on this.